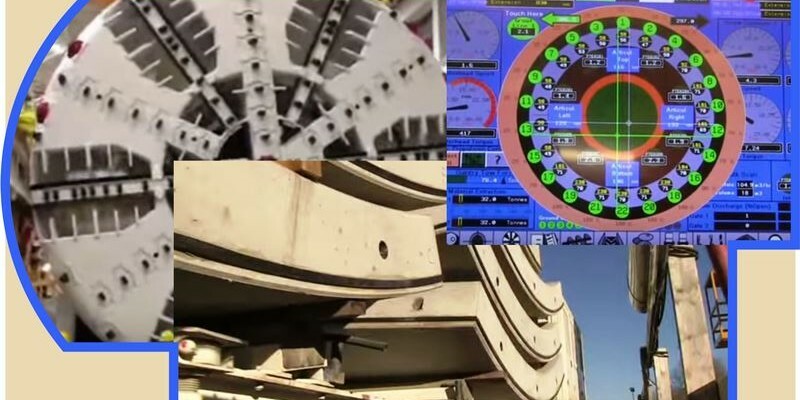 How Evergreen Line Tunnel Boring Machine Works? The spoils are then trucked away to an approved disposal site. Meanwhile, prefabricated reinforced concrete tunnel liner rings are being moved inside the tunnel. The eight sections that make up a complete ring are loaded on the specialized mine service vehicle or MSV for the trip. The MSV has a driving cab at both ends so it never turns around in always goes forward. First going through the transition tunnel under the Barnet Highway and then through the TBM assembly and launch area the MSV enters the bored tunnel and travels up to the tunnel boring machine’s backup assembly One at a time the ring segments are taken from the MSV and are transported by a complex system lifts and conveyors through the TBM backup systems all the way to the ring erector system. With tunnel boring paused for the next ring assembly,the ring erector uses a vacuum to pick up the concrete ring sections and move them into position for installation. But before the ring segment can be installed the heavy duty jacks that hold the segments in place need to be retracted. The final of the eight ring segments to be installed is the smaller key segment. Once in place it locks all the rings into position. Bolts are then used,tightening the seal between the segments for grouting. Pumps then inject grout outside the tunnel to fill any gap between the rings and the ground outside. After monitoring the ring installation from the control room it’s time to start boring again. Each of the green circles on the monitor represent the hydraulic jacks around the circumference of the TBM. By pushing off the concrete ring the TBM start moving again. Operators can adjust individual jack pressure to steer Alice, keeping her on course. The Evergreen Line, opening Fall 2016.